Although it’s not the slightest bit rational, we humans possess the primal urge to be terrified. We love it. Why else would we pay money to watch horror films? 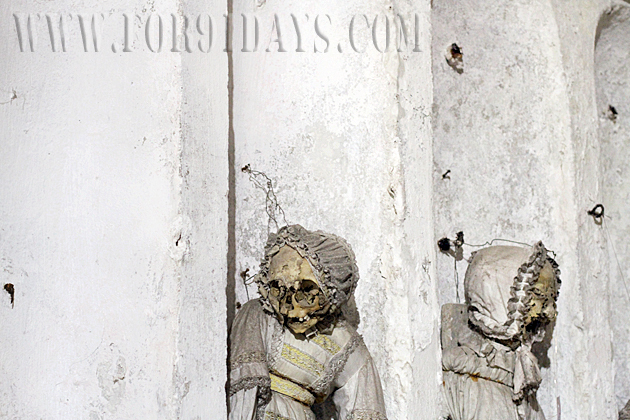 Why visit haunted houses, or tell ghost stories? 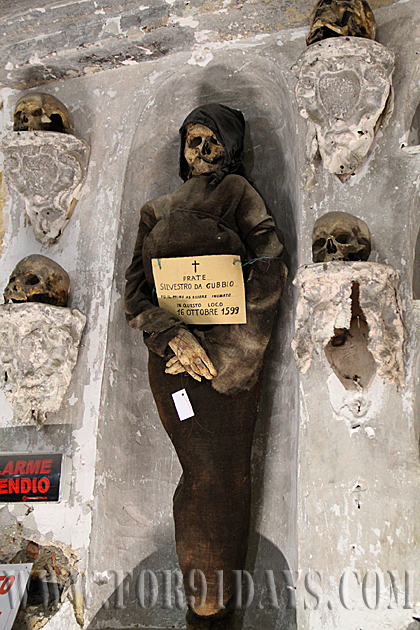 And in Palermo, a city of gorgeous churches and fascinating history, why should one of the top tourist attractions be the corpse-filled dungeon of the Catacombe dei Capuccini? What’s wrong with us? 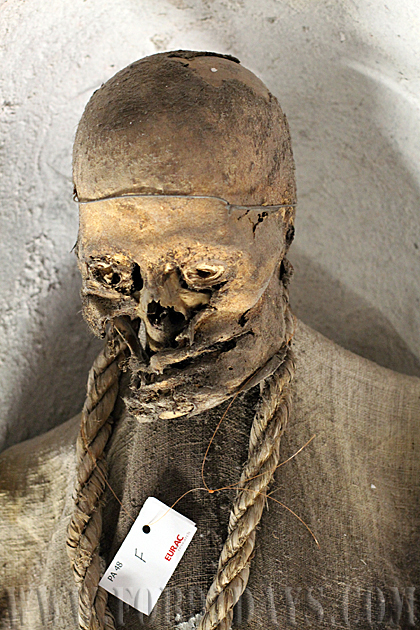 Face skin slowly peeling off skulls. 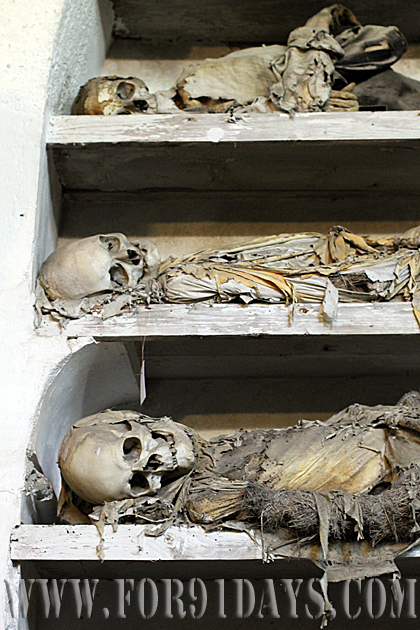 Corpses striking ghoulish poses as their bodies slowly fall apart. 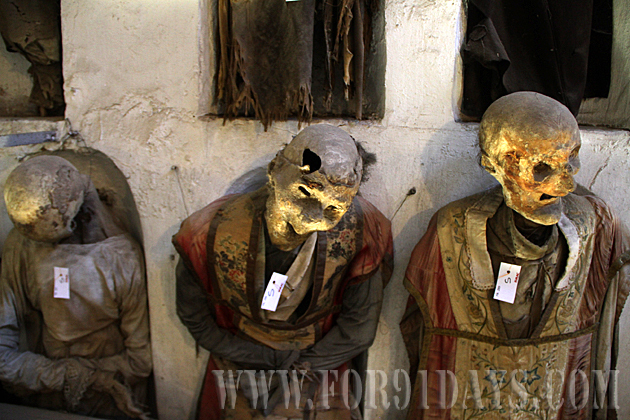 Hollowed-out faces with grotesque grimaces, teeth and even mustaches still intact. 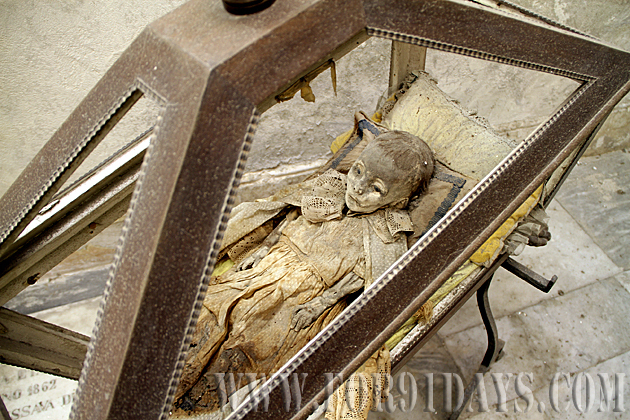 An infant in a tiny coffin, its face reduced to a pile of crinkled skin, like dry, crushed leaves. 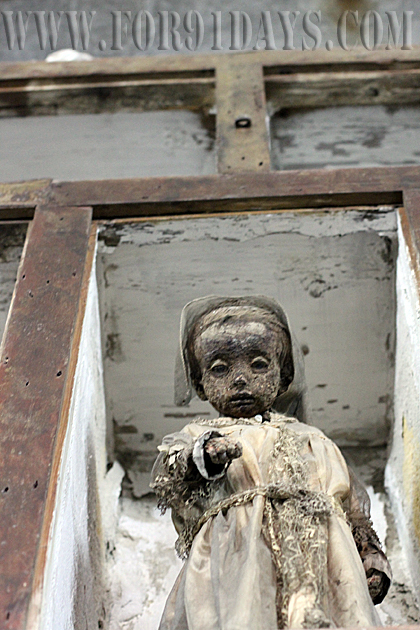 Monks dressed in hooded robes, staring at you from their eternal perch, and an entire army of the baby-undead. 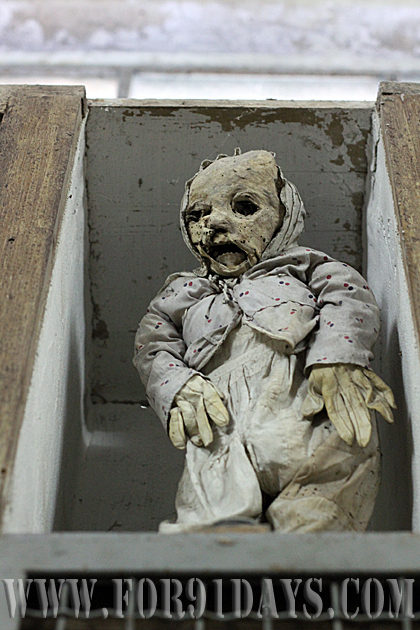 It isn’t the kind of horror which jumps out at you, and you scream and then laugh about it. 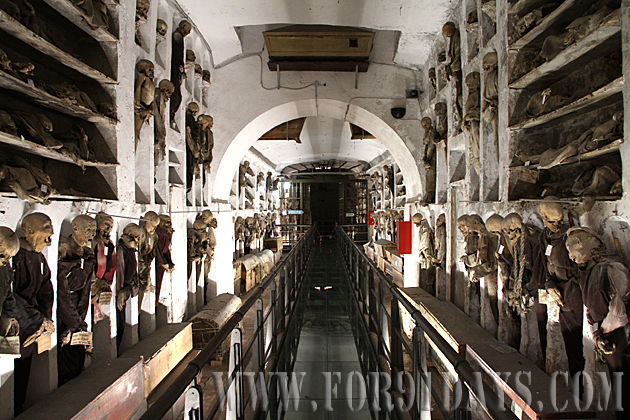 No, the catacombs provide the long-lasting sense of dread which worsens with each step. Which becomes more unbearable the longer you remain. 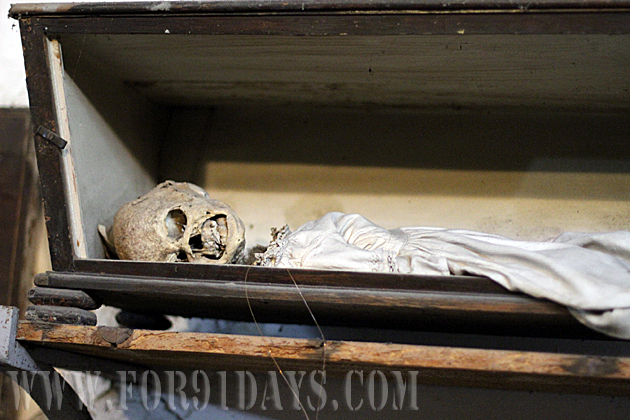 The first monk was interred here in 1599, and his 400-year-old corpse is still on hand to greet visitors upon entrance. 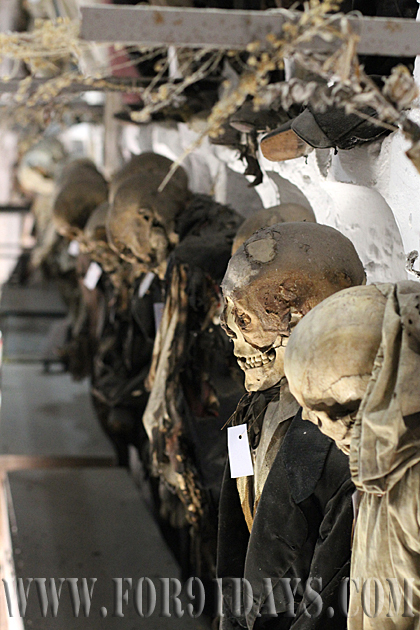 For centuries, the catacombs were strictly for the monks, but eventually opened to well-paying members of the public. 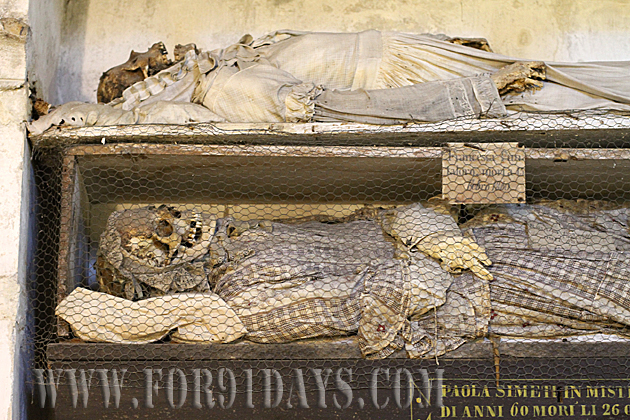 For reasons that can only be understood as macabre, families actually wanted the corpses of their loved ones preserved and displayed, so that they could come to visit. 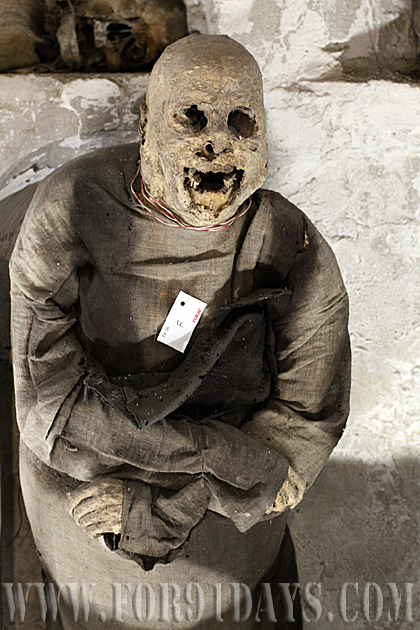 The standard method of preservation was to open up the corpse shortly after death and remove all the vital organs. Then the body would be stuffed with hay, and left in the sun to dry up. 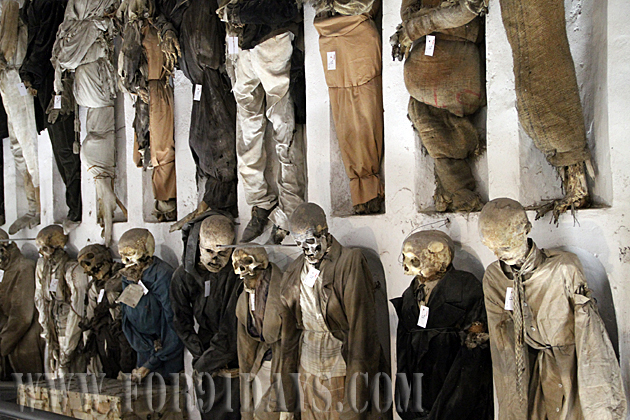 Many of the corpses have hay poking through their necks and falling out of holes in their skin. We can only pray that a herd of horses never finds its way into the catacombs, because that would be a truly unholy feeding frenzy. 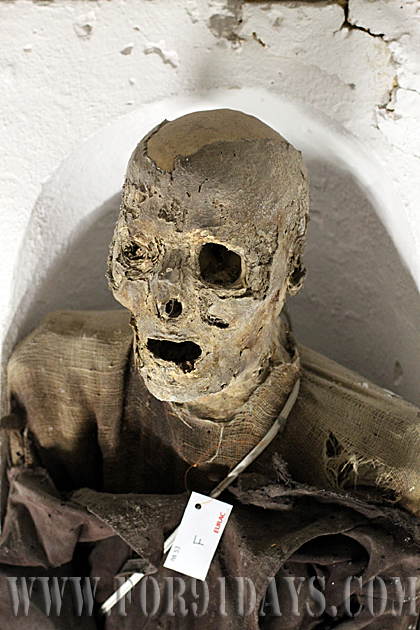 The final soul to be interred here was the benefactor of a special conservation process designed by a specialist named Solafia. 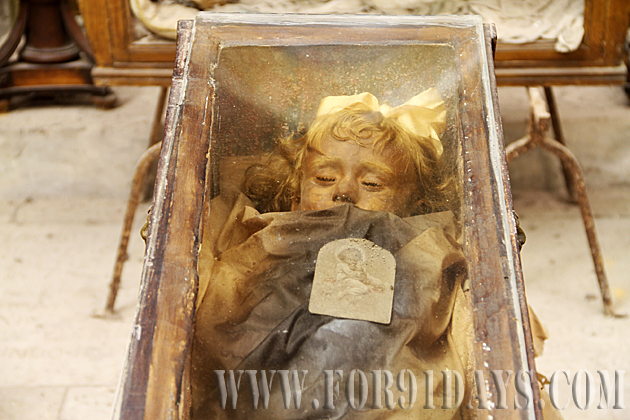 Baby Rosalia Lombardo died in 1920 at the age of two. 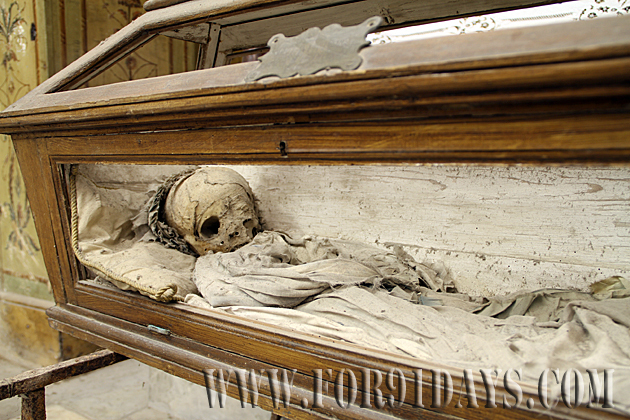 Her body, which rests in a special room of the catacombs, resembles a life-size doll, complete with eyelashes and hair. Far from being sweet or a “miracle of science”, she might be the most horrendous resident of all. The one who, you just know, is going to open her eyes the moment you turn your back. Luckily for all of us, the good Doctor Solafia died before he could pass on his preservation method. 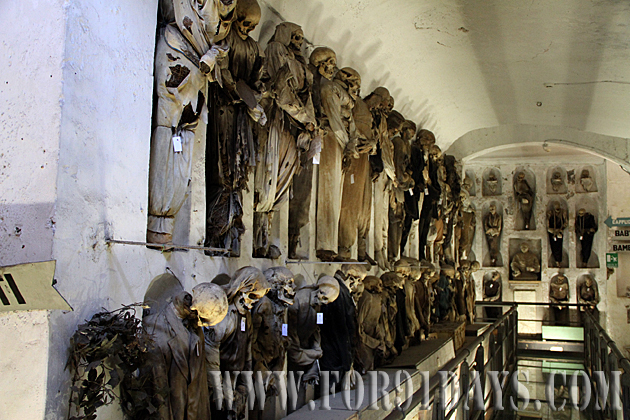 Because it’s such a unique and interesting place, the Capuchin Catacombs definitely warrant a visit. But those who are easily terrified might want to stay away. 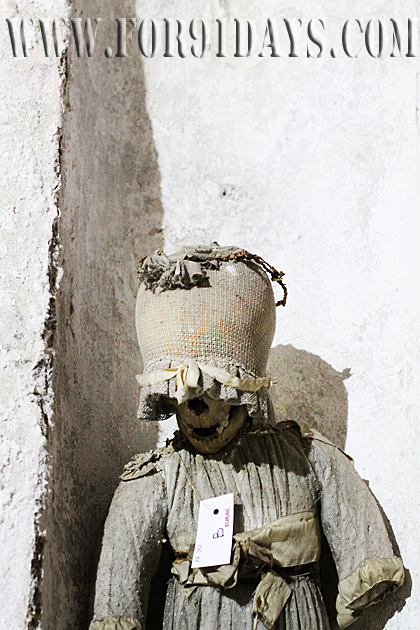 We brought Jürgen’s cousin, a sensible girl who normally refuses to visit even cemeteries. I’m not sure she’ll ever forgive us. 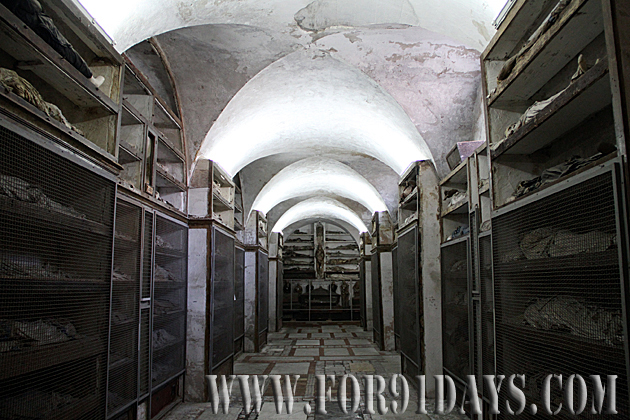 Photos and videos are strictly prohibited in the Catacombs, and we had to purchase permission at a rather hefty rate. Hence the watermarks. 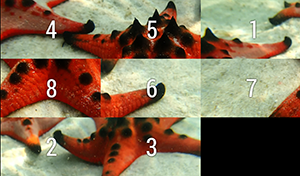 If you’d like to use these images, please get in touch. 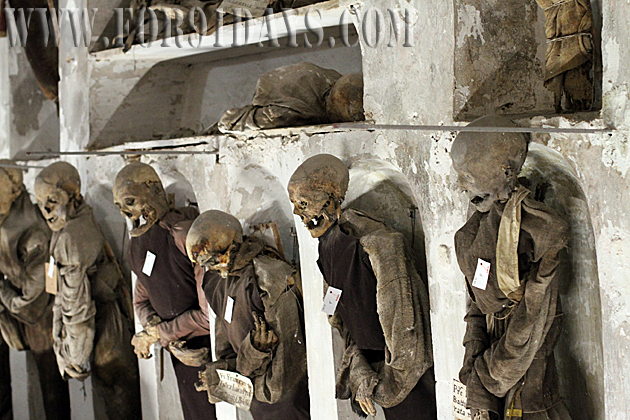 The Bone-Chilling Catacombs of the Capuchin Monks Found on the outer limits of the city, the Capuchin catacombs hold the remains of over 8000 souls, their disembodied shells propped up against the walls or resting in open caskets. 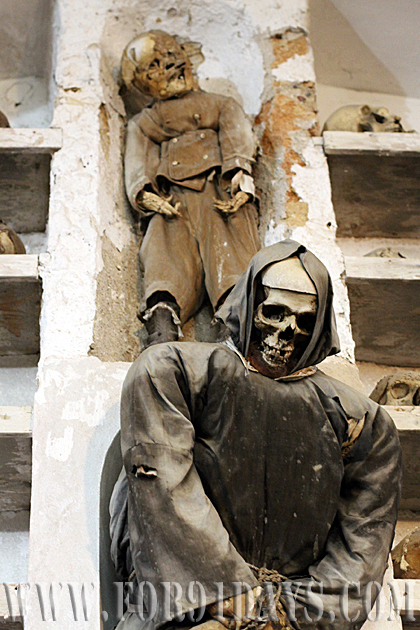 Down in the cold, dry basement of the monastery, the relentless march of decomposition takes its sweet time. It's a gruesome display. 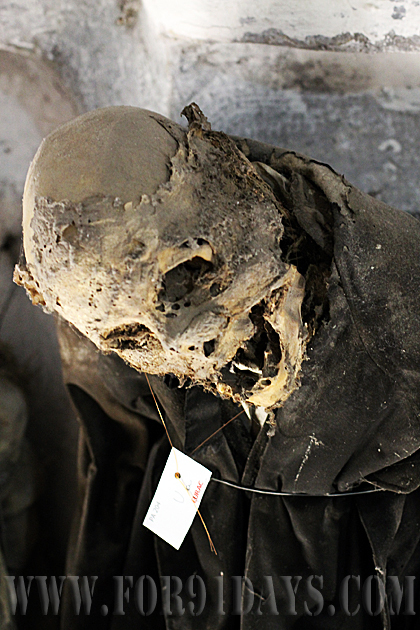 Though some bodies have been reduced to skulls and bones, the majority of corpses are still rotting, and their half-decomposed husks are the stuff of nightmares. 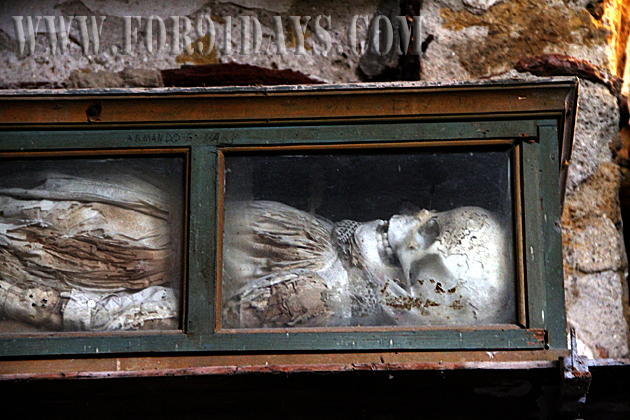 To me the most terrifying thing about Palermo’s catacombs has always been the contrast between the exposed corpses and the neon-lights. It gives me the idea that technology goes forward anyway and that materialism triumphs no matter what. Brrrrr. Terrifying, yet fascinating! 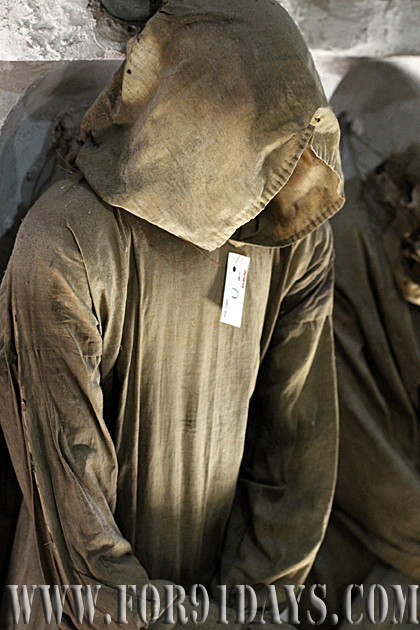 The hanging monks are a nice touch… I can’t believe how many corpses are down there! Umm, on this note goodnight all… and sleep tight. 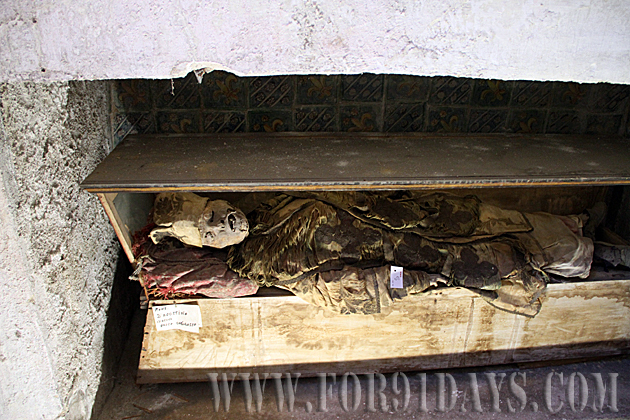 Not so much mummification as being left there to rot!? ICK!!!! 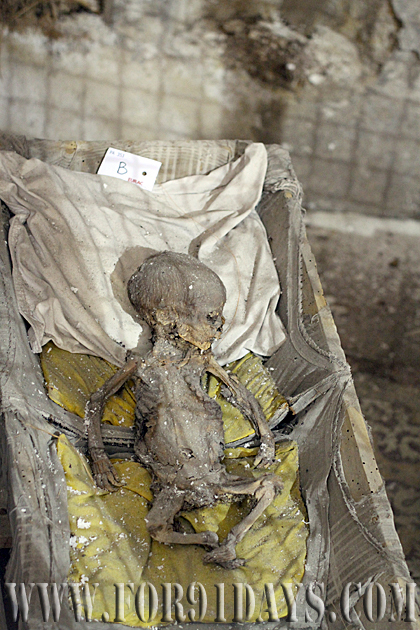 muy buenas las fotos aunque algo intrigantes de como es que terminaron ahi todos esos cuerpos. como dice la pagina hay que tener valor como para ir a verlo en vivo , yo por ahora veo las fotos y ni me acerco al lugar. At least theyre not walking down my street and looking in through my window. 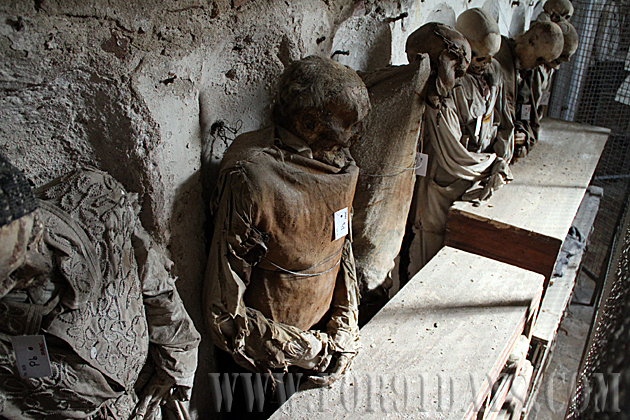 Visited here in July 2012, fascinating place, if in Palermo do not miss it! 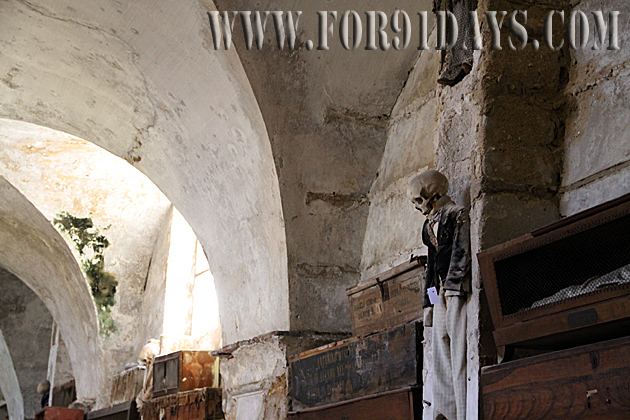 It is a place like no other, didnt find it scary but dont take any photos because a voice from above will tell you off and remind you that the bodies were once alive like you and one day you will be dead like them! Is that so? Are you referring to recorded messages? Your superb photos persuaded me to visit. This is like walking in to some seventies exploitation horror. 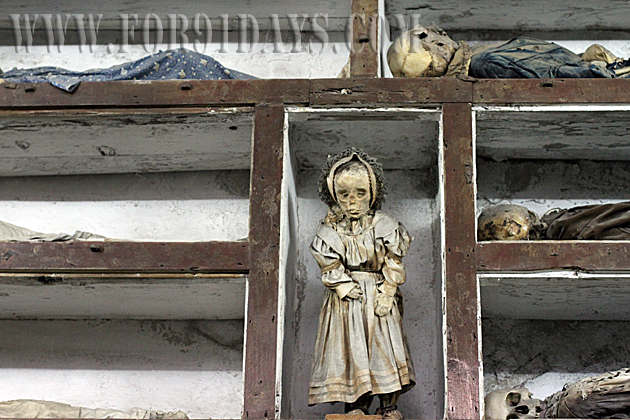 By far the most spooky is the little girl who looks as if she’s sleeping and abut to wake up…One bit of advice – the 327 bus which goes from Piazza Independencia will drop you almost at the door. The 389 or 109 buses go from the rail station to Piazza Independencia. It can be a little tricky to find but I asked a couple of locals and even not being able to speak Italian I could follow their directions.It is walkable from the centre if you’re fit.Not to be missed if you’re ever in Palermo. Stunning photos and very emotive. How much did it cost you to persuade the monks to allow you access to photograph? as they are most insistent on no film and no photography. Well done! Easy way out … we had to pay for a photo permission. But at the end it was def. worth it! Not really scary, but fascinating. 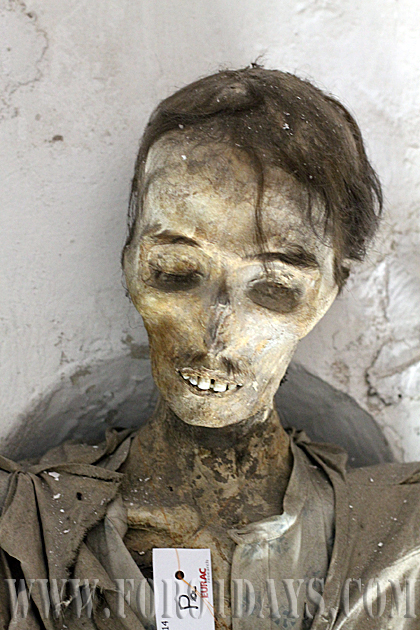 Probably because MOST of us don’t often see a dead body, particularly one that lived so long ago. 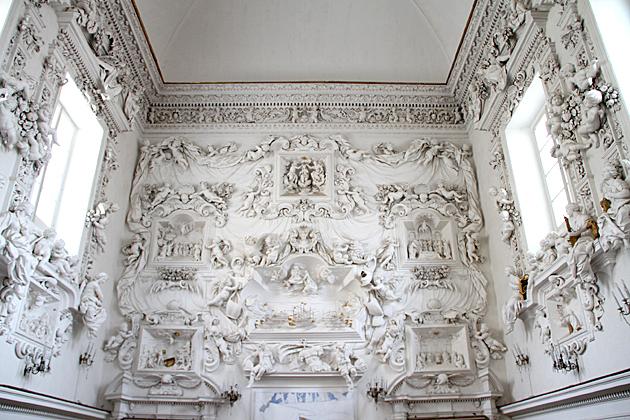 I once saw a documentary from Italy where the family would periodically pull their loved ones out of the mausoleum wall and rearrange the bones into elaborate patterns. Guess they’re just not very squeamish on the subject of death. Perhaps the whole process is meant to desensitize one. A very graphic reminder that it will one day be YOU! 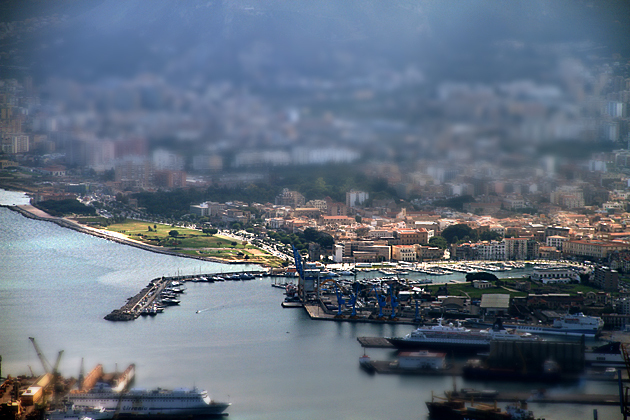 My father was born near Palermo, Sicily, so Ive been here several times. ..first time at 12. I was fascinated…!! Took my children in 2010 (8 and 10) they too loved it. I’d say the images are far more scary than the actual visit…and it’s not nearly as “horrendous” as the blogger makes it out to be. In fact, it was considered an honor and prestigious to be buried here…and for years, the relatives of the dead paid their respects (and the upkeep) of this underground church tomb. 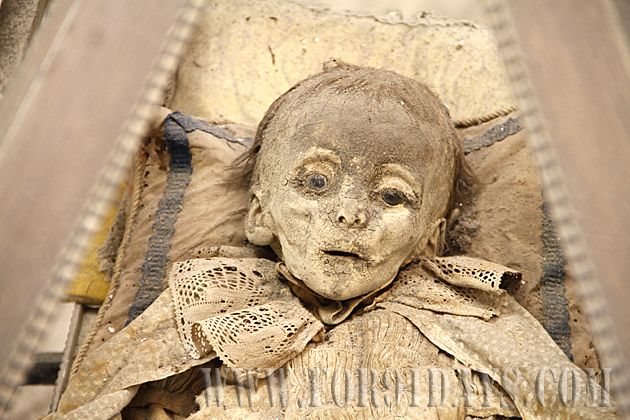 The mummified child left an impression on me at a young age…and remarkably, has not changed one bit since I first saw her over 30 years ago. 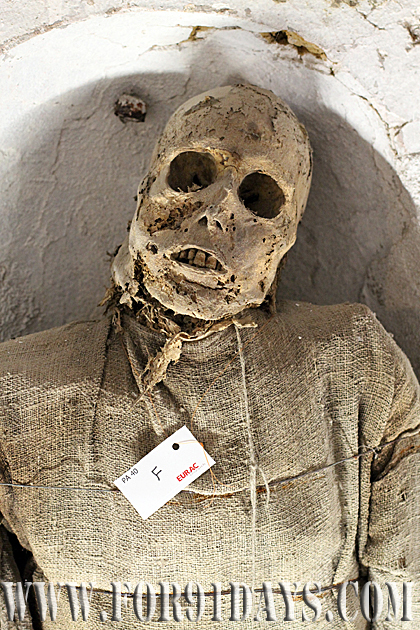 I recommend visiting the catacombs if you ever have the chance to visit Sicily…not for it’s macabre appearance, but for the appreciation of the ancient rituals and the respect the Sicilains had for their dead. most of these photos shown are postcards…Postcards which are for sale within the church. 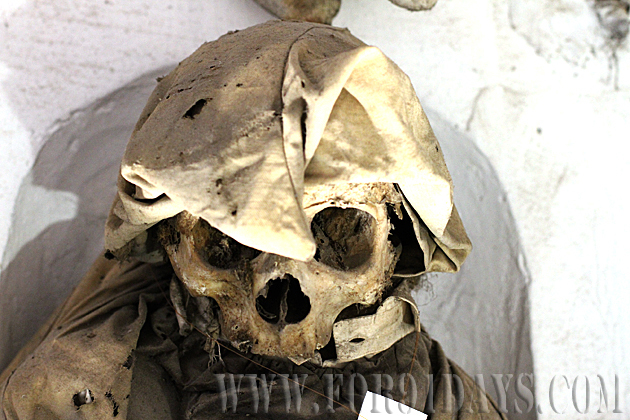 in 1983, I recall I was able to take photos… however photos are now prohibited (at least they were when I last visited in 2010 and 2011) due to preservation of the corpses. Thank you for the comments … the pictures here shown are taken by me. 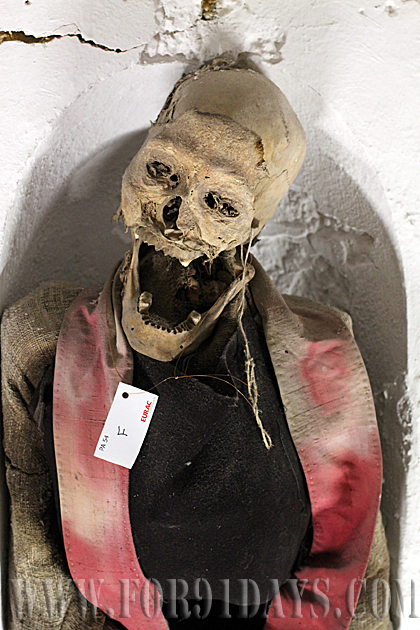 We obtained a special and rare permission to take these photos. Glad you enjoyed them. I found these photos absolutely fascinating! 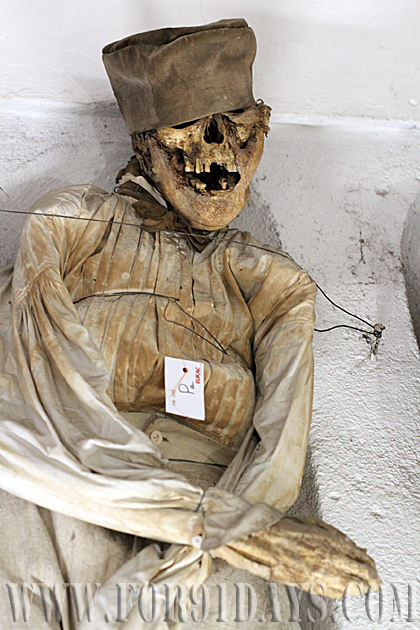 I’d love to visit the Catacombs someday in the future but as I can’t afford to travel anywhere, I can’t see that happening, so thank you for taking these photos and sharing them with us. 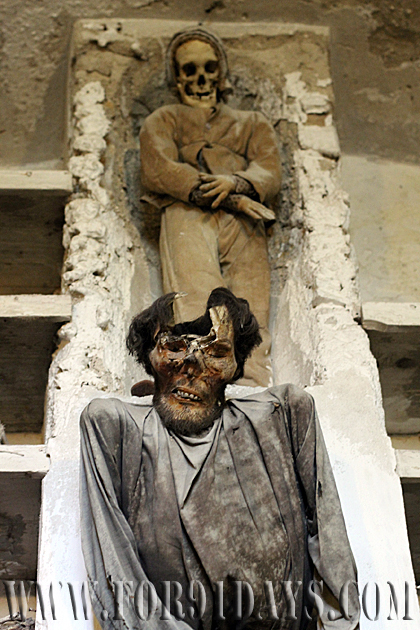 I’ve always been interested in this sort of thing for some strange reason and even though I’d find it a bit eerie if I did visit and witness this for myself, I know it would enlighten me not frighten me. What a beautiful place. What better way to honor these souls. I have to go visit someday soon. In the mountains above Sorrento there is a village where a scene from the Godfather Part 2 was filmed. It’s the one where Michael proposes to Appolonia. There is a church and convent run by, I can’t remember, Filopino nuns, I think. 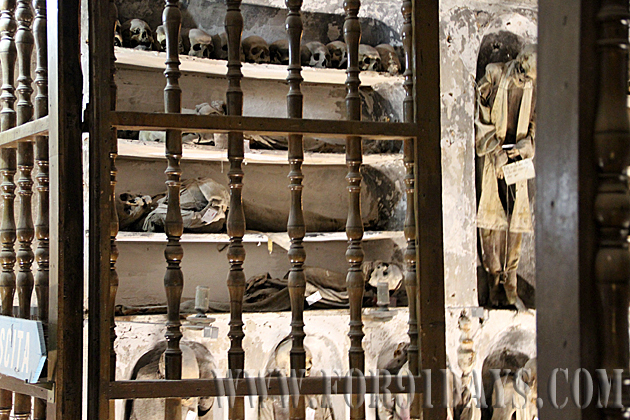 Anyway, they have a similar Capuchin crypt but not nearly as large. 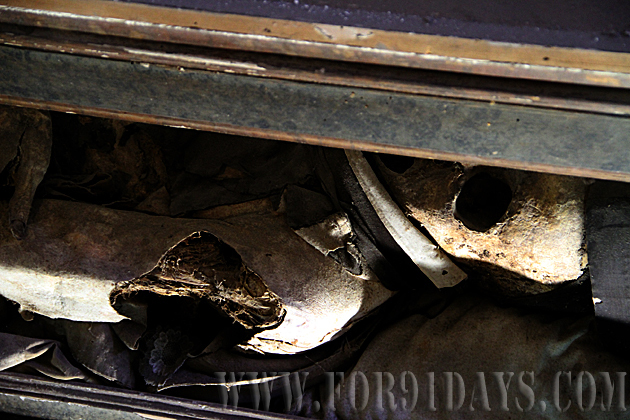 I believe I would bring a very well made breathing mask before going into that place as the dust contains the skin and bone of the bodies, that said it’s a look into the past as no other words can describe how these people must’ve lived, I’m wondering what did the children die of ? thanks for the photos. I think that they should let them rest in peace. I was fascinated by the display. 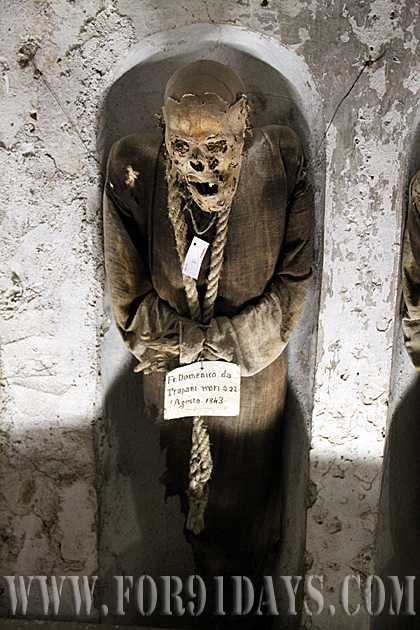 The ropes around the neck of the Capuchin monks made me feel of their faithfulness even unto death. If given a chance, would visit again. Does no one else think that this is incredibly disrespectful to the dead? 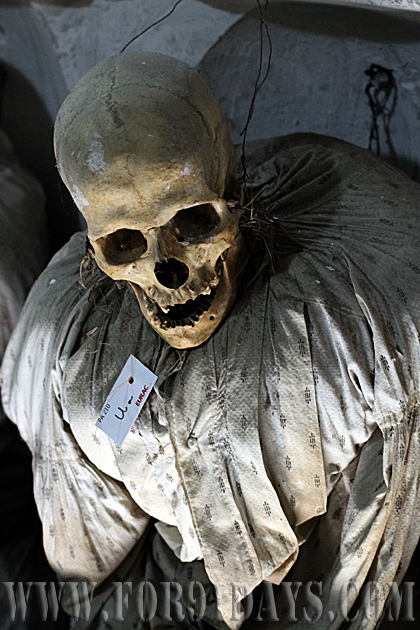 I know I, personally, wouldn’t like to be put on display for the world to see when I die. It’s morbid and, quite frankly, shows these once very alive people the smallest amount of respect imaginable. I was there in the winter of ’63. I had my 8mm and took film of much of this. One thing that stands out as I was looking at these pictures, it is not the way it was. 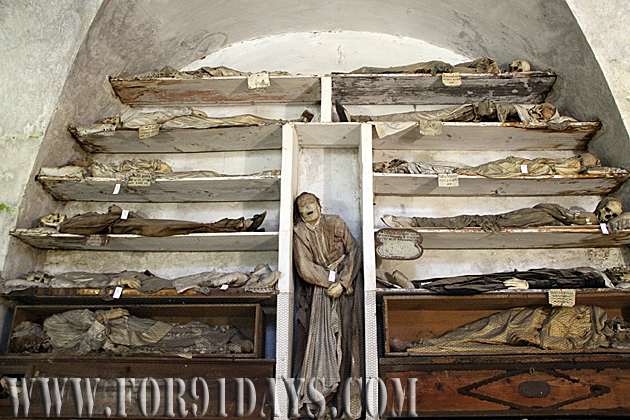 It has been cleaned and many bodies moved and displayed. 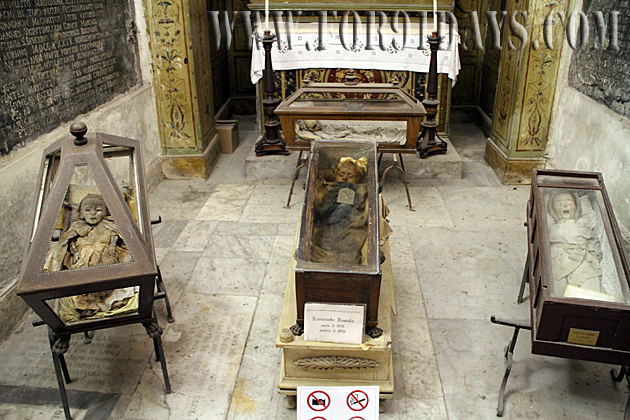 Rosalia Lombardo has been totally relocated along with the other children and placed where they are now. Lighting has been updated. I know 50 years is a long time ago but my memory is not that bad. 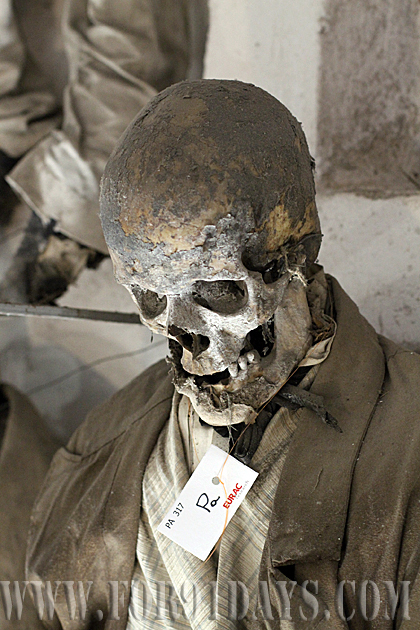 Also the tags on the deceased have been added, I would suppose for catalog and documentation as much as possible. 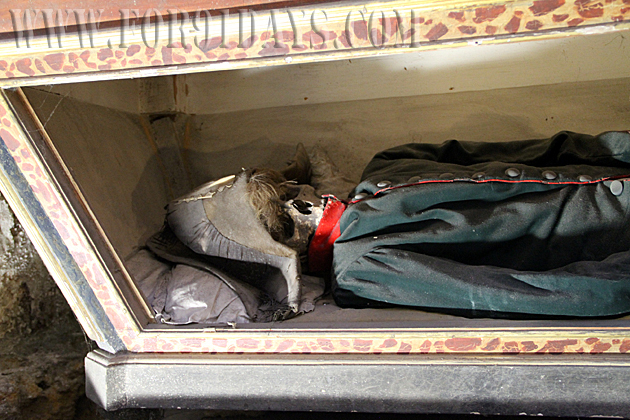 When I first saw Rosalia’s burial coffin, the glass was cracked, I see that it has been replaced and resealed, when??? There was not a restriction then on filming and taking pictures, many others did as I, filming. There were piles and piles of bones and skulls, we were told as time passed and the remains fell from the walls that they would be gathered and placed into the bone piles also as space was required, old ones removed, replaced by newly deceased although there were no new ones when I was there, I think Rosalia was one of the last to be placed into the catacombs. 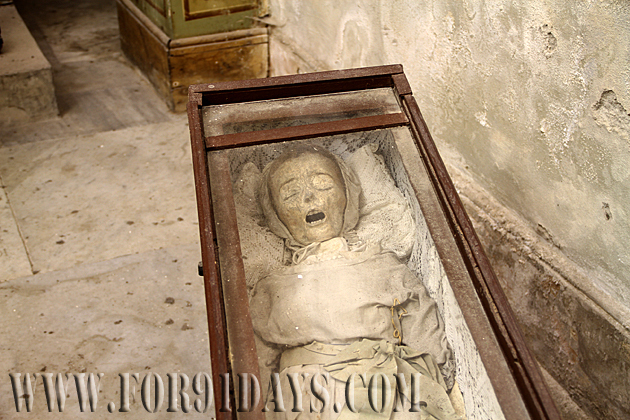 She was very well preserved, looking as if she would awaken at any time. Her skin was bright, full of color and shiney, only her eyes were slightly sunken. Also for those concerned, I did not detect any odor, just dry. I’m sure there was dust in the air from, well every thing but, it was not noticeable. It was not errie (to me) but there was a feeling of, well quiteness and respect. Will I ever return, rather doubtfull but my Grand daughter insists that I take her to Italy, maybe? Scary but great photos! I particularly like the way you captured the capuchin monks. My wife had to go away as she couldn’t stand watching this horrific photos. We would love to visit the place and experience the same feeling. Are there any hotels around the place? If you do not mind me asking, how do you go about getting the permission for photos, and what is the cost? Your photos are excellent. Thanks! You have to ask the guard about the permissions, and the current price. I think the price depends on the project and the intended use of the photos. I’m not sure if there’s a phone number — we actually drove out there a week before we wanted to take the pictures, and asked in person. Hello, me again. Another thing I forgot to mention was to bring some tissues. When you the area where the babies and children are it gets pretty emotional. I was there May 2008. The temperature was dry and cool. It was very peaceful and not scary as some may think because of the pictures. I wasn’t allowed to take pictures. Would like to visit again. I get claustrophobic but I was OK here because the chambers are quite big & airy. I, too, found the neon lights a 2st Century intrusion. 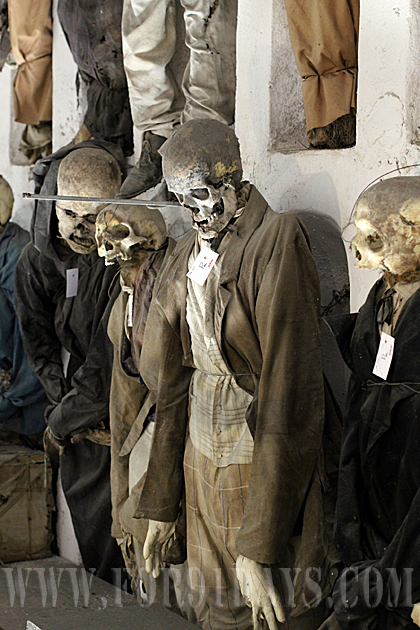 What impressed me the most were the clothes the dead are wearing. Remember the soldier on the Quality Street tin, with the tall hat and the stripes going across his chest? There are men dressed like that, for example. 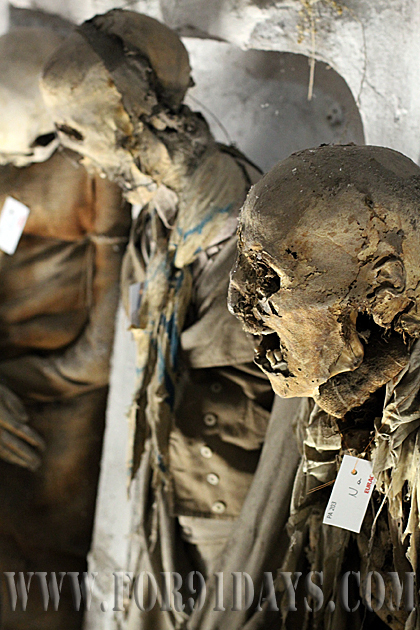 An unmissable experience if you are in Palermo. But I was very glad to get out of there into the sunshine. 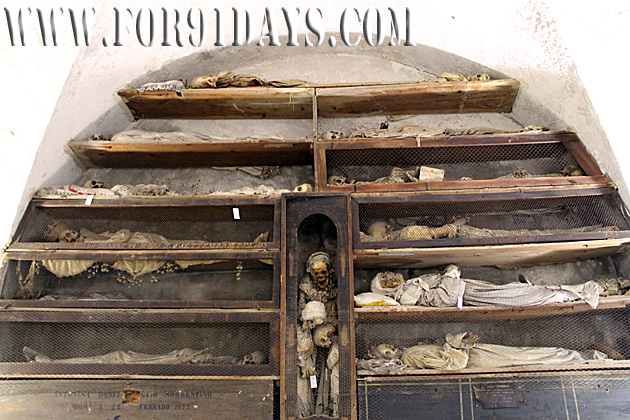 Went to the tombs today and got a little teary eyed and felt sad that so many bodies are on display for all to see. 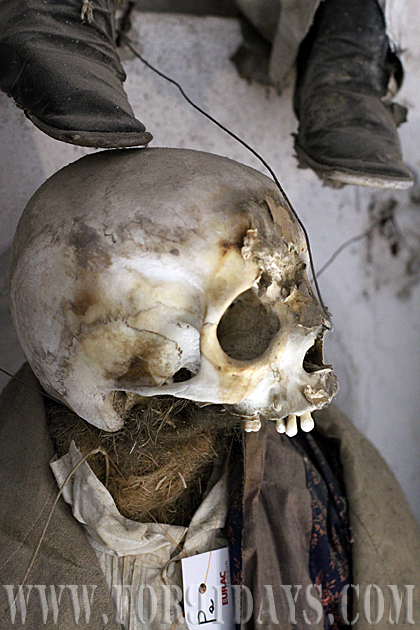 But I also found the entire experience interesting as you get to see how the human body is in decay close up..
Would truly recommend a visit…but try to get there closer to opening hours as it’s in middle of nowhere…. What are the names of the children in the caskets next to Rosalie, and of the one little one that seems to be pointing her /his finger at the camera? I’m writing a horror novel and I want to try and incorporate them into my book. I absolutely love these photos. Like another lady had said I will probably never be able to visit there so the photos are a wonderful look inside this special place. Everyone is completely entitled to there opinion but I don’t understand why people would call this scary,gruesome or any of that. 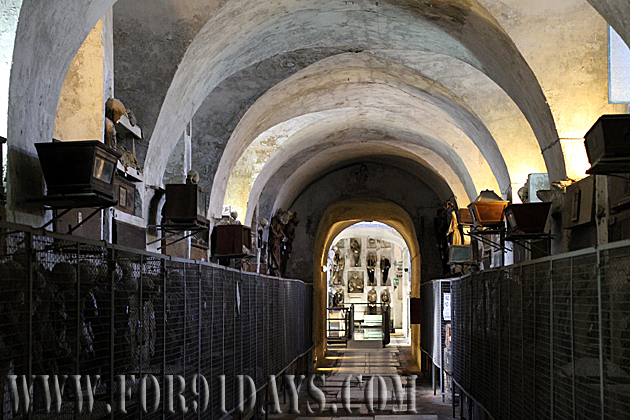 I truly believe that the catacombs are a celebration of life and they are being remembered in death. 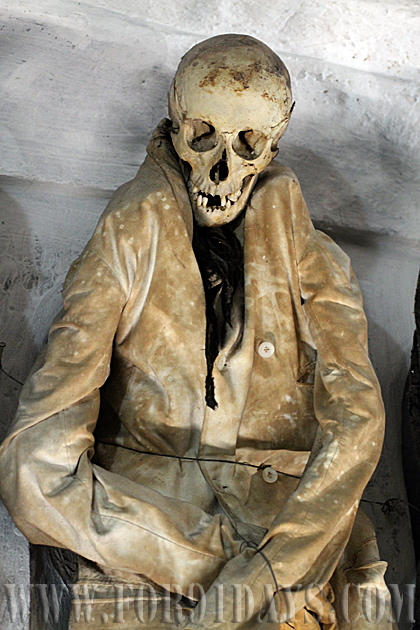 Death is enevitible so what is so scary about it? I would be honored to have hundreds of people want to come and pay there respects and take photos of which have never met me. The fact of being able to see these people so many years after there death is amazing to me. This is definitly not something you are able to see everyday. I have always been intrigued by all aspects of death and the unknown. We are used to burying our loved one and that’s it that’s all. To be able to see that person pretty much forever after there passing is awesome to me. To see the process the body goes thru over the years is fascinating. If it would ever be possible to go there I would love to have the chance we will see. Just like the people in the catacombs I guess only time will tell..